47% of consumers view 3-5 pieces of content created by a company before talking to a salesman from that company. So whether you are a business blogger or just blog for fun, SEO is crucial to make your blogging efforts worth the hassle. SEO or Search Engine Optimization is when you prepare your blog for the search engine. These search engines use “crawlers” that are fed with an algorithm that automatically rank content based on how optimized it is. So, in layman terms, SEO is basically keeping these crawlers happy with your content. This may sound simple, but in reality, SEO is an ever-changing field because the SEO strategies you were using 2 months ago might be outdated now. As the name suggests, on page SEO is when you optimize your content for the search engine. All the SEO activities in an On-Page SEO are controlled from the back end of your blog. This includes SEO for blog posts and landing pages. When you’re writing content for your blog, you would want it to rank for a certain keyword. The process of searching for a keyword and using it to rank your content is called keyword optimization. While keyword optimization is one of the many sure shot techniques to rank your content higher in the SERPs, you must be careful when using keywords in your content. Many bloggers tend to use a lot of keywords while they are doing SEO for blog posts because they want the crawlers to see those keywords. This technique is referred to as “Keyword Stuffing” and can result in a Google Penguin penalty. Keyword placement is an important element of keyword optimization. In order to effectively implement on page SEO for blog posts, you must know where you should place your keywords. An integral part of seo for blogs is that there is no argument that your keyword must be present in your meta title and meta description for. But if it doesn’t fit in organically, you should never force it in. Google crawlers are smart enough to identify when a keyword is forcefully used and when it is used organically. Using keywords in your URLs can make your SEO for blog posts more effective. However, you must be careful to not make your URL lengthier than it should be. Again, only the keywords included organically will give you the results you want. In order to make SEO for your blog work, you need to use keywords within your content body. The recommended way is to use a keyword in the first paragraph or within the first 100 words. This helps you get to the meat of the content earlier making it more readable for the user. While you are doing your SEO for blog posts, you must also take into account adding keywords to your images. This can be done through the “Alt Text” field when you are adding images to your blog. Keyword optimization is a must to make your SEO for blogs work more effectively and give you the results that you are aiming for. When it comes to SEO for blogs, interlinking is essential for on page SEO. It creates a network of links within your website. The suggested strategy for link building is that the deeper you link the better. Avoid linking pages like Contact Us and Home Page. Beneficial interlinking is one that is done deep within the structure of your content. A do follow link will make your SEO for blog more successful. Also, make sure that the links you create are relevant to the content. While interlinking is done on the same website, external linking is done to give backlinks to other websites. This is great for SEO for blog posts because it creates an external network of links that the Google crawler can track. However, you must be very careful that the external link should be relevant. Irrelevant links can result in a Google Penguin penalty. Make sure that your URL is to the point. Don’t stuff your URL with unnecessary words to make it lengthy. As mentioned above in the article, you must include keywords in your URLs. However, avoid stuffing or using the same keywords twice in the same URL. Using numbers is generally considered a bad practice when creating URLs. 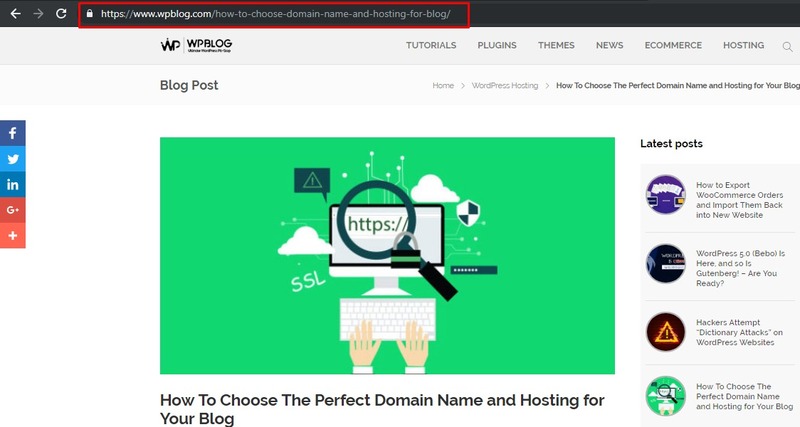 For example, if your blog post with the title “10 best WordPress themes” and URL is “/10-best-WordPress-themes” will make it difficult for you to update the article. If later you want to make it 15 WordPress themes, you won’t be able to change the URL to “/15-best-WordPress-themes” because changing the URL will mess with your rankings. Special characters in your URLs is displeasing to Google crawlers. Make sure that you avoid them. Not using stop words like “an” a” “the” is a great way to keep your URLs short and simple. It is recommended that you use hyphens to separate words in your URLs. When it comes to SEO for blogs, having an SEO friendly theme is another way to impress the Google’s crawlers. An SEO optimized theme will indicate the crawler that your website is trustworthy and the content on it is authentic. So what makes a theme SEO optimized? Google crawlers always have a soft spot for themes with a clean code. Crawlers find it easier to read the content of your website if your theme’s code structure is clean. Speed has always been preferred by search engines. Make sure that the theme you are using loads faster. You can also use cache plugins to speed up your website. This is one of the most important elements that Google considers when ranking a website. Your theme must display your content on all screen sizes and devices. Time and time again Google has stated that it will prioritize secured domains over unsecured ones. Having an SSL certificate not only lets Google know that your website is secure but also your visitors. This might look odd to you but using a theme that is used by thousands of other bloggers is not exactly the best way to go. If you can, use a unique theme or an original theme for your blog. Off Page SEO is when you optimize your blog through external sources. After you have published a piece of content on your blog is when you carry out the off page SEO. There are some proven off page SEO techniques that you must know about if you are to successfully implement your SEO for blogs. Link building is an age-old off page SEO technique and probably the most effective one. Link building is when you create a network of links from other websites to your website. Google crawlers take into consideration how well your blog is connected with other blogs of the same niche and category. Building links can be overwhelming because you would want to build as many links as possible. However, this technique is often discouraged. “Quality over Quantity” is the mantra for link building. You might wonder what’s a quality backlink? A quality backlink is when it is when built organically. Google crawlers are smart enough to detect a backlink that is built forcefully without proper context. A quality backlink is a link build on a blog with higher DA. A blog with a DA of 50 or above is considered an excellent resource for backlinks. This technique is for bloggers who have been running a blog for quite some time. it might not be that effective if you’re just starting off but I would highly suggest you write it down somewhere because you would definitely need it once you go big. The tool I would recommend using for this technique is AHREFS. The first step is to search your domain name in Ahrefs and look for its backlinks. You will see a list of domains that have already given you backlinks. These domains are already fans of your content and will most likely link your new content as well. Export this list and create a database of the domains that have given backlinks in the past. Get in touch with them whenever you publish new content. Create relationships with these domains and you are more than likely to get backlinks from them. Stealing competitor’s backlinks is a strategy for both, new bloggers and old timers. Again, I would recommend using Ahrefs for this strategy. First, carry out a research of your competitors that are blogging in the same niche. Now if you are just starting your blog, your competitors would be small and medium-sized blogs in your niche. But if you have been blogging for some time, you can consider bigger blogs as your competitors too. Make a database of your competitors on an excel sheet and enter them one by one on Ahrefs and search their referring domains. You will see a huge list of backlinks coming from a number of domains. The next step is to study the backlinks and figure out how they were created in the first place. Usually, there are 2 scenarios. Guest Posts: Guest posting is still being used to build quality backlinks. It can be easily identified as most of the time it is stated that it is a guest post. Recurring backlink sources: This type of backlink is usually done through relationship building. As a blogger, building useful relationships with other bloggers should be one of your most important tasks. Once you have studied the backlinks of your competitors, it makes it easier to copy them and use those resources to your advantage. A combination of both on page and off page SEO can make your SEO for blogs do wonder. You won’t see results right away and your patience will be tested time and time again. The key is to be persistent because there is a lot of competition out there and it’s not easy to rank for a good traffic keyword. When it comes to SEO for blogs, there is no other way around it without understanding the value SEO provides for blogs nowadays. Conducting SEO might seem like an old idea but that is far from the truth. SEO for bloggers is just as important as anything nowadays but the techniques that were used for SEO for blogs is not the same. Still, certain techniques can be used for making sure Google’s crawlers are happy and help rank your content on top. If you think there is something missing in this article with regards to SEO for blogs, please comment in the box below. The post SEO for Blogs – How to Optimize Your Blog for Higher Ranking in SERPs appeared first on WPblog.